When Sabrina loses her 14-year-old son to a police shooting, she�s unable to face the ensuing flurry of media attention. Crippled by grief, she retreats into a fantasy world of superheroes and arch-villains that inhabit the comic book created by her son before his death. Assuming the role of The Maasai Angel rather than the expected part of the grieving mother, Sabrina battles her enemies along the way to peace. This world premiere play helmed by lauded director Robert O�Hara (Barbecue, Bootycandy, Eclipsed) is both heartbreaking and highly inventive. 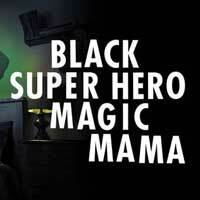 With unbridled imagination, Los Angeles-based playwright Inda Craig-Galv�n�s Black Super Hero Magic Mama gives us the hero we have been waiting for. Don�t miss this show at the Geffen Playhouse in Los Angeles. "...Part of the problem is the lack of dramaturgical rhythm. Craig-Galvan writes in episodic snapshots that have a halting stage flow. The other issue is the fuzzy direction, which fails to establish a crisp and confident tone for the production. Domestic scenes grow slack, and intermittent bursts of satiric parody (of the media and other societal problem spots) are clumsily calibrated." "...Although the writing isn't ready for a premiere yet, the designs are. Scenic designer Myung Hee Cho has placed the action high enough onstage that everyone in the theater, even those not seated in the risers, can see, and the revolving stage lets us see Tramarion's bedroom from various viewpoints, while other brief scenes can play out elsewhere without too much slowing of the action." "...The World Premiere of BLACK SUPER HERO MAGIC MAMA, helmed by lauded director Robert O'Hara, bursts with visually stunning life from the vibrant imagination of Los Angeles-based playwright Inda Craig-Galv�n and the creative artistry of scenic designer Myung Hee Cho, lighting designer Alex Jainchill, costume designer Karen Perry, projection designer Yee Eun Nam, with original music and sound design by Lindsay Jones. These designers are to be commended for bringing both the everyday and comic book worlds of a 14-year old boy into focus, as experienced by his supremely devoted mother who proves the greatest superpower is a mother's love." "...Playwright Inda Craig-Galv�n puts a personal face on a national epidemic in Black Super Hero Magic Mama, a Geffen Playhouse that scores points for originality provided you�re a fan of Marvel/DC blockbusters." "...In a shazaam! moment Sabrina is transformed into The Masai Avenger and, with sword in hand, goes out to do battle against her race's enemies-essentially almost all the characters from Act One, now doing double duty as comic-book baddies." "...If the story sputters in the second act, it's still worth a looksee for video designer Yee Eun Nam's kaleidoscopically imaginative visuals; this talented theater artist outdoes herself here. Costume designer Karen Perry has great fun with the fantastical costumes, and outfits the sisters smartly in the first act as well." "...The show reminded me a little of The Wizard of Oz, as Sabrina becomes the 'Maasai Angel' confronting a slew of individuals before reaching the entity, her son. Craig-Galvan tries to create humor and silliness in sad times, yet after intermission, it just didn't work for me. It was too long, and disturbing, especially the cowboy pointing guns at the 'Maasai Angel's' face and watching a villain being electrocuted. Maybe comic book fans will find this more appealing."